I recently started making my own bitters, and as a result I needed some high-proof bourbon to extract a few ingredients. I found a bottle of Old Grand-Dad 100 bonded bourbon at my local liquor store. I’d had regular Old Grand-Dad and found it to be a decent well bourbon, though I think I prefer Four Roses Yellow a tad, but I’d never tried the 100. And my experience with bonded liquors has been pretty damn good, as Rittenhouse (unfortunately not carried in my state) and Laird’s Bonded are both wonderful, inexpensive options. After using most of the bottle for extracting various spices, I decided to try taking a swig of it, and damn was it tasty. It’s got a deeper, slightly sweeter, spicier, oakier, and just generally more complex flavor than the Four Roses Yellow. (I don’t have a bottle of the lower proof Grand-Dad handy for comparison.) After realizing it was my new favorite well bourbon (how the hell is that bottle only $17?) I read up a bit on it, and I think the flavor comes from a higher rye content in the mash bill and, of course, the higher proof. I quickly decided I wanted to try it in some cocktails, so I busted out my trusty PDT Index (kudos to whoever made that thing, for you sir have saved me many hours of page flipping) and started sifting through. One caught my eye quickly, the Gold Rush. 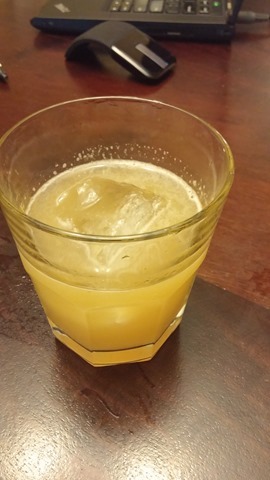 The Gold Rush is three ingredients, bourbon, honey syrup, and lemon. It’s a lot like a Penicillin, but without the ginger. At first I didn’t get it. I mean, the drink isn’t that out of the ordinary is it? But then I realized it’s now 12 years later. Of course this drink wouldn’t be a revelation to me, since cocktails spent years improving before they got to me, thanks in large part to guys like Meehan. No matter how much I may love Led Zeppelin, and I do, I can only appreciate their influence academically. I wasn’t there when they dropped a bomb on that poppy British invasion crap and spawned the genre I so love. And so maybe that’s what this cocktail is, it’s the Led Zeppelin of drinks. When viewed alongside all of the drinks that comes after it, it’s still damned good, but not out of the ordinary. Viewed chronologically in terms of the cocktail revival, its import might be greater than you’d otherwise realize. But anyway, the fact remains, it’s damned good. And it’s simple. And it’s cheap. I think you can make it for like $1.50. And your customers wouldn’t be disappointed to pay $10 (or New York $15) for it. It uses three very common ingredients every bar has. Without further ado, here’s the recipe from the PDT Cocktail Book, page 134. Shake and double strain over one big ice cube in a rocks glass. No garnish. 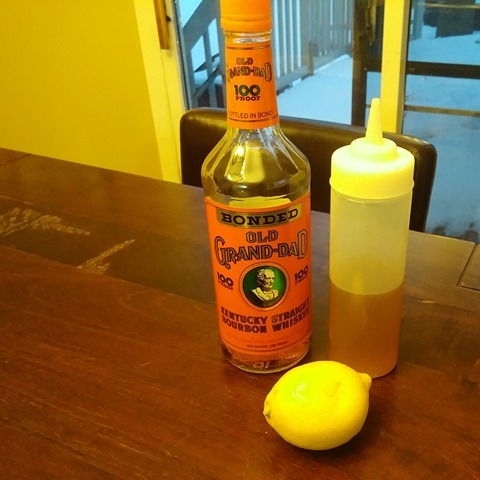 Notes: I think the over-proof bourbon really makes this drink, so try Old Grand-Dad 100. I also think rye is fantastic, but then I’m famous for using rye in place of everything. Put in pot on stove over low heat, stir until dissolved, then chill. Put in squeeze bottle. This entry was posted in Recipes and tagged classics on January 30, 2015 by Genius. Glad you like the index… I am seriously contemplating doing the same with the Death & Co book. That was you? Consider yourself my hero.